In any industry, there are great minds and pioneers who lead the way for all those who follow. It’s fair to say that the engineering sector wouldn’t be what it is today without those who made innovations which were well ahead of their time. 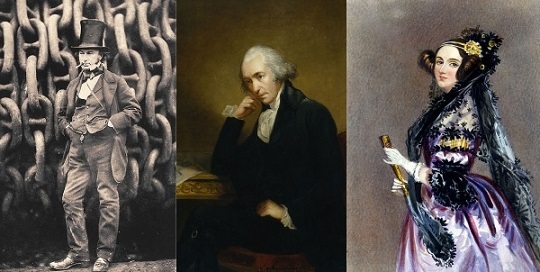 In this article, we take a look at some of the most important figures in engineering history. Brunel was famous for his innovation; although his projects were not always successful, he achieved many firsts in engineering, and many of his greatest achievements still stand to this day. Although he did not live to see its completion, Brunel is perhaps most famous for the Clifton Suspension Bridge, which had the longest span of any bridge in the world at the time of its construction. Alongside work on bridges, he was also the chief engineer of the Great Western Railway and he built the SS Great Britain, the world’s first ocean going, propeller-driven iron ship. This Scottish inventor and mechanical engineer was pivotal in the Industrial Revolution. Although he did not design the first steam engine (or even the first practical one), his improvements transformed it into a much more powerful machine by adding a separate condenser to make use of energy that was otherwise wasted. By 1790, the steam engine was used in cars, railways, ships and factories on an unprecedented scale, transforming the face of the world. Flying in the face of engineering and mathematics being perceived as solely masculine activities, Ada Lovelace was instrumental in the development of modern computing. Her notes on the Analytical Engine developed by Charles Babbage include what is thought to be the first algorithm intended to be carried out by a machine, effectively making her the world’s first computer programmer. Alan Turing was highly influential in the development of theoretical computer science, where he provided a formalisation of concepts of algorithms and computation with the invention of the Turing machine. This feat of engineering was considered to be a model of a general purpose computer. Due to this invention, Turing is generally considered the father of theoretical computer science and artificial intelligence. During the Second World War, Turing was part of the Government Code and Cypher School, a codebreaking centre based at Bletchley Park. He devised a number of techniques for breaking German ciphers and played a pivotal role in cracking intercepted coded messages, which enabled the Allies to defeat the Nazis in several battles, the most notable of which was the Battle of the Atlantic. Where would we be without being able to send a text message? In today’s world, it seems almost impossible to function correctly without using your mobile phone to send a message on a daily basis. We have Norwegian engineer Thomas Haug to thank for introducing text messaging in 1992. Haug led a team of experts from a dozen countries at CEPT (the association of European Telecommunication Operators) in 1982 after he was elected chairman of the committee. In this role, he was in charge of the digitalisation of telecommunications and introduced features such as SIM cards and SMS messaging during his 10-year tenure. Earlier in his life, Haug was part of the Swedish Board of Telecommunications, where he was engaged in the development of computer-controlled exchanges. He led a project for cellular communication called NMT in 1970; this venture led to the introduction of an analogue system in Saudi Arabia in 1980, followed by four Nordic countries between 1981 and 1982. The NMT enabled automatic roaming between any two users, regardless of national borders and reached 1 million subscribers in 1990. Possibly one of the greatest minds of our time, Elon Musk has done plenty for 21st-century engineering. Musk is the CEO of a number of high-profile businesses, including Tesla, PayPal and SpaceX. At SpaceX, Musk conceptualised a ‘Mars Oasis’ when founding the company back in 2001, a project that looked to land a miniature experimental greenhouse on Mars containing food crops in a bid to show that human life could be possible on the planet. Since then, the company has made history on a number of occasions, the most notable feat being their ‘Dragon’ spacecraft which became the first commercial spacecraft to deliver cargo to and from the International Space Station. At Tesla, Musk has successfully brought fully-electric vehicles to the market at affordable prices. Tesla also supply several major car manufacturers, such as Mercedes and Toyota, with affordable electric powertrain systems. In 2014, Musk even announced that Tesla would allow its technology patents to be used by anyone in good faith, as a way of encouraging more automobile manufacturers to develop affordable electric cars. Of course, these are just some of the most well-known names of history; even today there are many heroes of engineering simply going about their day-to-day jobs. Some will be recognised in their lifetime – the upcoming New Year’s Honours list is likely to recognise a few individuals for their services to engineering – but others may not. We would like to take this opportunity to recognise every engineer for their hard work at developing the world of the future. As spring manufacturers, we believe that all the innovations mentioned in this article have had a profound effect on the engineering industry and even general everyday life. Here at European Springs, we are keen to continue to build on these fantastic innovations and provide our customers with the very best products and services possible.